Ranieri will be honored at the organization’s 12th annual reunion at Goddard State Park in Warwick on Sunday, August 5. Criteria for the “Tops Award” are set with high standards. To be considered, an individual must have been with the club for at least five years (about 10% of the Reds’ 51 years); must have achieved outstanding performance in his Reds’ association; must have shown himself as a leader, and must have established himself as a good-will ambassador for the Reds through involvement in local residency and outstanding service to the community. The Reds first took note of George’s abilities after he recorded two sensational seasons in the International and Eastern Hockey Leagues. 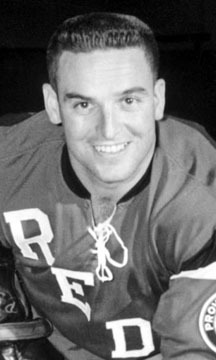 In 1958-59 with Louisville he led the IHL in goals (60) and total points (124). The following year with the N. Y. Rovers in the EHL he planted 35 goals and 80 points. Joining the Reds for his rookie year in 1960-61, George did not disappoint fans in any way. He became one of the American Hockey League’s most productive young offensive players, netting 30 goals and 41 assists for 71 points in 72 games. For the next two seasons he scored 21 each year, helping the Reds to gain playoff berths in both years. Well on his way to another great season in 1963-64 – already having netted 20 goals in just 54 games - one fateful night at Springfield in February 1964 George sustained a horrific head injury that nearly took his life. In those days players did not wear helmets and in a collision with a Springfield foe George flipped backwards and landed with full force and body weight on the back of his head. Transported by ambulance from a Springfield hospital to The Miriam Hospital in Providence, George laid in intensive care for three weeks before surgeons were able to remove a massive blood clot from his brain. In all, he spent seven weeks in the hospital before being discharged. For his first outings he demanded to watch his teammates – including Ed MacQueen, Harry Ottenbreit, Matt Ravlich and Ross Brooks - play out the 1963-64 season at the old R. I. Auditorium. George had always been respected for his mental and physical determination. So defying all odds and reason, he returned to the Reds the very next season (1964-65) and surprised everyone by scoring 18 goals in 61 games. But that was it for pro hockey and George Ranieri. During the summer of 1965, at age just 29, he received a lucrative offer to join the sales team at the Molson Brewing Company in Canada. “They made me an offer I couldn’t refuse and hired a guy with three holes in his head to help sell their beer,” George quips with his customary sense of good-will humor. Since retiring from playing hockey, George Ranieri has spent many hours and years donating his time, talents and affable personality to community projects. They include Molson Oldtimers’ Hockey Charity Games, the Toronto Italians’ Oldtimers’ Hockey Charity Games, and he has been part of the Dundas Oldtimers’ fund-raising support for minor hockey. He also coached the Dundas Merchants Intermediate A team to a championship. In a more serious moment he confesses, “Rhode Island was the best place I ever played.” His fond attachment still remains for Rhode Island hockey fans, the Reds’ team and teammates and the old R. I. Auditorium.